One way in which Tauck differentiates itself from other tour operators is the meticulous research and attention to detail its staff puts into every travel package it offers. So much so that when a new tour is developed, its designer and other staff members travel the entire itinerary themselves—not just once, but twice, in order to experience it the way their guests will. “We do it from start to finish in the way that it will be presented to guests, and that includes staying in the hotels, dining at the restaurants, riding the charter buses and experiencing the amazing sites and attractions,” says Valerie Dulin, who since 2010 has served as a Tauck product manager and tour architect. That’s exactly what Tauck did with the special Michigan Tour it has offered each summer for many years, and why it partners with Indian Trails. Launched in 1925, Tauck is still a family-owned business—now in its third generation and headquartered in Wilton, Conn. It is the only company to be named both the “World’s Best Tour Operator & Safari Outfitter” and the “World’s Best River Cruise Line” by the readers of Travel + Leisure magazine—and Tauck has captured both honors three times. Over the years, Tauck has grown to include six brands offering more than 140 trips across all seven continents. It’s one of the world’s most highly regarded tour operators, delivering life-enriching travel experiences to every corner of the globe, incorporating small cruise ships, premium riverboats, trains, helicopters and more—plus exclusive content through ongoing partnerships with filmmaker Ken Burns and BBC Earth. With a customer-service focus similar to Indian Trails’, Tauck’s successful formula is to do the right thing: Craft a life-enriching travel experience; provide it at a single all-inclusive price; ensure there is great value for the money; and rely on recommendations of loyal, satisfied customers to build a following and grow the business. Each of Tauck’s vendors, from hotels and restaurants to charter motorcoaches, has to meet the company’s exacting standards to become part of a tour package. “We’ve worked hard to establish an incredible reputation, so it’s important to all of us here to meet or exceed our brand standard in the tours we provide,” adds Dulin. And that’s why Tauck has partnered with us for decades to provide charter coach service for its “Michigan’s Lakes & Mackinac Island” summer tour packages. The eight-day package offers a journey to northern Michigan that includes a stay at the Grand Traverse Resort and Mackinac Island’s Grand Hotel, stops at the Music House Museum, Sleeping Bear Dunes, and Frankenmuth, as well as visits to the Ford Rouge Factory and Greenfield Village, a wine-tasting event, and a Detroit city highlights tour. Michigan tour-goers, Dulin adds, particularly appreciate our new-model motorcoaches and friendly, accommodating drivers. Dulin has been working in the travel industry for 29 years. Her interest in travel was sparked while working for a harbor master in Halifax, Nova Scotia, where she recorded data from ships coming in from around the globe. Dulin also works to tweak existing tours for the enjoyment of customers. For example, a Motown act and an excursion on the Tall Ship Manitou were recently added to the Michigan package. “They both have become highlights of the tour.” At the same time, Dulin appreciates those aspects of a tour package that remain the same, like Tauck’s relationship with Indian Trails. If anyone can tell you, off the top of her head, all the ins and outs of charter bus travel, it’s Theresa McNamara. 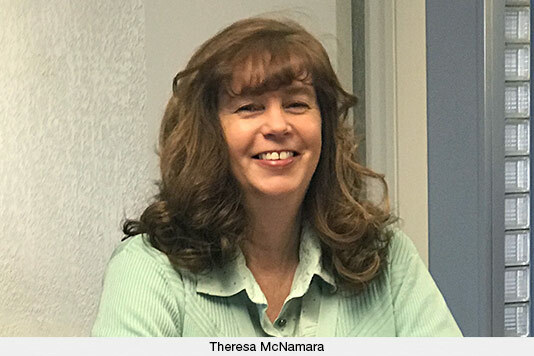 As inside sales supervisor at Indian Trails, Theresa oversees the operations of our charter sales department, including reviewing the details of each planned charter bus trip, the availability of buses (and knowing where they are at all times), assisting customers, and providing sales reports. She supervises three charter consultants as well as our switchboard operator, helping consultants and customers plan trips, making recommendations, and often going out on the road to ensure that a planned trip goes smoothly. This week, for example, Theresa is spending time with our drivers at Michigan State University as our motorcoaches ferry prospects for the Alumni Distinguished Scholarship Awards to various buildings on campus. “I’m there with a two-way radio to troubleshoot and contact drivers if needed—such as if a session the students attend ends earlier than anticipated.” She likes that these trips give her the opportunity to get to know the drivers better. It’s no wonder she’s a big fan. She’s the daughter of a dad who pitched in the Minor Leagues, and the little sister of five brothers. “I think I’ve been a Tigers fan since I learned to walk and play ball with my brothers. The youngest of them first put a bat in my hands.” In fact, at one time Theresa played City League ball with Owosso until an errant ball hit her in the face, breaking her nose, and causing her to give up the sport. Before joining Indian Trails 20 years ago, the Elsie, Mich., native had worked as a bookkeeper at Chemical Bank and been a stay-at-home mom. Then she accepted a position as a charter consultant with us. “The on-the-job training and 13 years of experience doing that was very beneficial when I was named supervisor seven years ago,” she says, adding that as supervisor she’s on call 24/7 for charter customers. Among the aspects of the job that she values is our company culture. If you make travel arrangements for one or more groups (a business, school, sports team, trade association, social club, etc. ), kindly take a few minutes to tell us about your latest charter trip with Indian Trails. 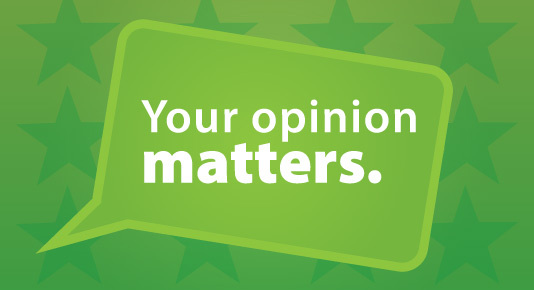 The information you share in THIS QUICK ONLINE SURVEY will enable us to develop operational improvements that can benefit your organization and other charter groups for years to come. After all, we’re striving to be your motorcoach transportation provider of choice for the next 100 years! Either way, however, we thank you for helping us to serve you even better! What better time to start thinking spring—and planning a tour of our state’s magnificent gardens—than when the ground freezes solid and snowflakes fly? To come up with this list of great Michigan gardens, we used the ratings of actual visitors as posted on the TripAdvisor website. If the following descriptions of fragrant blooms, lush landscapes, serene nature walks, tropical conservatories, woodlands, waterfalls, and historic landmarks give your group ideas for an unforgettable charter bus trip, please don’t wait to call us at 800-292-3831. Our deluxe motorcoaches are often booked months in advance, and one of our expert charter consultants can help you plan the perfect trip. 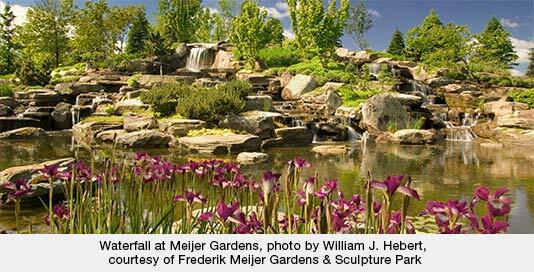 One of the nation’s most significant sculpture and botanic experiences, the 158-acre Meijer Gardens includes Michigan’s largest tropical conservatory, five indoor theme gardens, outdoor gardens, nature trails, boardwalk, library, café, gift shop, and meeting rooms. The stunning garden setting—which has attracted more than 10 million visitors since it opened in 1993—features exotic plants, desert and Victorian gardens, wetlands, and meadows, along with sculptures by famous artists throughout. Visitors tend to love the beauty of the place and its children's garden, Japanese garden, butterfly exhibit, tram ride, Christmas trees from around the world, and summer concert series. Read visitor reviews. 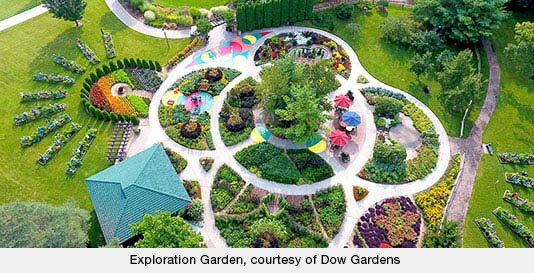 The Dow Gardens are a dazzling 110-acre display of annuals and perennials punctuated by distinctive bridges, an award-winning children’s garden, towering pines, and delightful water features. Admission includes access to the 54-acre Whiting Forest, featuring woodlands, ponds, an apple orchard, stream, and the nation's longest forest canopy walk—1,400 feet long—soaring up to 40 feet above the ground. Visitors tend to love the beautiful grounds, children's garden, butterfly house, rose garden, water features and canopy walk. Read visitor reviews. This National Historic Landmark tells the story of Edsel and Eleanor Ford and their family through their historic home on the shores of Lake St. Clair. The son of Henry Ford, Edsel built his grand home in the style of the Cotswold villages in England. It is filled with original antique furnishings, as well as art from the Fords' vast collection, and surrounded by 87 acres of scenic lakeside grounds. The latter include the Tribute Garden in honor of Eleanor and all women, the Great Meadow, the Peninsula/Bird Island, Flower Lane, the New Garden (created in 1939), the Rose Garden, the Lagoon, Lakeside Lawn, and outer buildings such as the Play House, Recreation Building, Gate Lodge Garage, and North Cottage. Visitors tend to love the mansion, play house, power house, pool house and rose garden. Read visitor reviews. Matthaei Botanical Gardens and Nichols Arboretum are operated by the University of Michigan. At Matthaei, you’ll find display gardens such as the Gaffield Children’s Garden, Bonsai & Penjing Garden, Great Lakes Gardens, and others; many trails and natural areas; as well as a conservatory of plants from around the world, a gift shop, and meeting spaces. Nichols Arboretum is located on the U-M central campus next to the U-M hospital. A haven for students, faculty, staff, and visitors, it’s home to the Peony Garden, several collections of historic or native plants such as the Julie Norris Post Collection of Ericaceous and Appalachian Plants, Centennial Shrub Collection, prairie, and more. Visitors tend to love the children's garden, bonsai collection, perennial garden, plant and flower sales, greenhouse and hiking trails. Read visitor reviews. 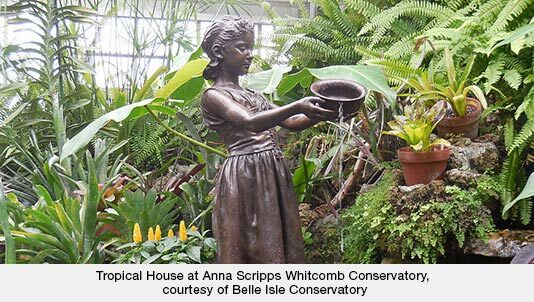 The Anna Scripps Whitcomb Conservatory is an exotic and rare collection of plants from around the world. The oldest continually-running conservatory in the United States, it’s divided into five sections: the Palm House, the Tropical House, the Cactus House, a sunken Fernery, and the Show House. The Conservatory occupies a 13-acre parcel of land shared by the formal gardens and the Lily Pond. Visitors tend to love the tropical plants, formal gardens, memorial fountain, fern room and lily pond. Read visitor reviews. At 105-acre Fernwood, beautiful gardens surrounded by forest are tucked into a landscape of cultivated and natural areas along the scenic St. Joseph River valley. Outdoors in the nature preserve there are miles of trails. Indoors, visitors can enjoy an art gallery, fern conservatory, nature center, cafe, and gift shop. Rocky cliffs occupy the center of the 1,000-square-foot conservatory, with a waterfall cascading down to a goldfish pond at one end. Besides the 100 different types of tropical ferns, the conservatory houses a constantly changing exhibit of incredible orchids. Visitors tend to love the herb garden, model railroad garden, water wheel, relaxing walks, beautiful grounds and sculptures. Read visitor reviews. Opened in 1993 and since featured in many children’s books, the Michigan 4-H Children's Gardens are made up of more than 60 small theme gardens and theme displays. There are mazes, pots of gold, an alphabet garden, Peter Rabbit, and much more. The theme gardens are located in three distinct areas: the Outdoor Garden, Indoor Garden, and Schoolyard Demonstration Garden. Visitors tend to love the learning experience for kids, lily pond and its frogs, the flowers, plants and herbs, the maze and—at the nearby MSU Dairy Store—the ice cream. Read visitor reviews. The 755-acre Hidden Lake Gardens was donated to Michigan State University in 1945 by Adrian businessman Harry Fee, who started it with a purchase of the original 200 acres in 1926. MSU describes it as “a faraway place that is one of the most picturesque in the Midwest and the nation” where “subtle and bold courtyards display trees as artworks.” The gardens include several greenhouses; a conservatory with many valuable and rare species of plants; a visitor center that houses a library, exhibits, auditorium, meeting rooms and gift shop; a Hosta Hillside outside, along with picnic areas, 12 miles of hiking trails, and six miles of one-way paved drives. Visitors tend to love the hiking trails, fall colors, gift shop, conservatory, and as a setting for picnics. Read visitor reviews. The centerpiece of the Cranbrook Educational Community campus, a National Historic Landmark, Cranbrook House and Gardens was created by Detroit newspaper magnate and philanthropist George Gough Booth and his wife, Ellen Scripps Booth. In 1904, they purchased a 174-acre run-down farm in Bloomfield Hills, and named it Cranbrook after the English town that the Booth family hailed from. Visitors tend to love the mansion's arts and crafts style, the beautiful property, the sunken garden, japanese garden, reflecting pool, science museum and lake. Read visitor reviews. There are actually several individual gardens within the 14-acre collection of MSU Horticultural Gardens: The Michigan 4H Children’s Garden, Amien Carter Annual Gardens, Judith A. DeLapa Perennial Garden, Clarence E. Lewis Landscape Arboretum, VIP Garden (Vegetables and Insect Pollinators), and Frank’s Nursery and Crafts Rose Garden. Some date back to the 1920s. In addition, MSU offers The W.J. Beal Botanical Garden, located on campus at 330 West Circle Dr. It’s a 5-acre outdoor lab for the study and appreciation of plants. Established in 1873, it is the oldest continuously operated university botanical garden of its kind in the U.S., featuring more than 2,000 different types of flowers and other plants within its five acres. Collections include economic, systematic, landscape, ecological, Michigan, and endangered plants. Visitors tend to love the rose garden, children's garden, arboretum, blooming plants and landscapes. Read visitor reviews. Roses are red, violets are blue, Michigan’s newest and largest fleet of motorcoaches is always here for you! 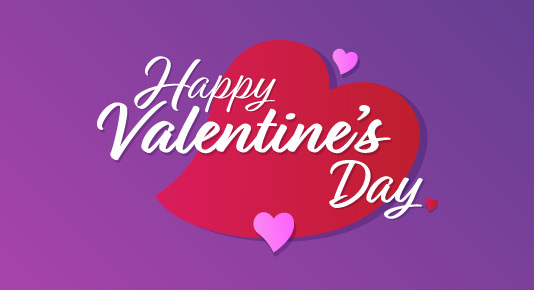 Happy upcoming Valentine’s Day from all of us at Indian Trails! We love serving you 365 days a year. Wishing you and your sweeties all the best and safe travels always!